Once in while we have the pleasure of meeting people who completely redefine love for us. As per me, Carolina and Franklin Delos Reyes were just those people! 50 years of their togetherness taught me the meaning of long-lasting companionship, and I was honoured to be their Vancouver wedding photographer to capture all precious moments of their 50th wedding anniversary at the Vandusen Botanical Garden. 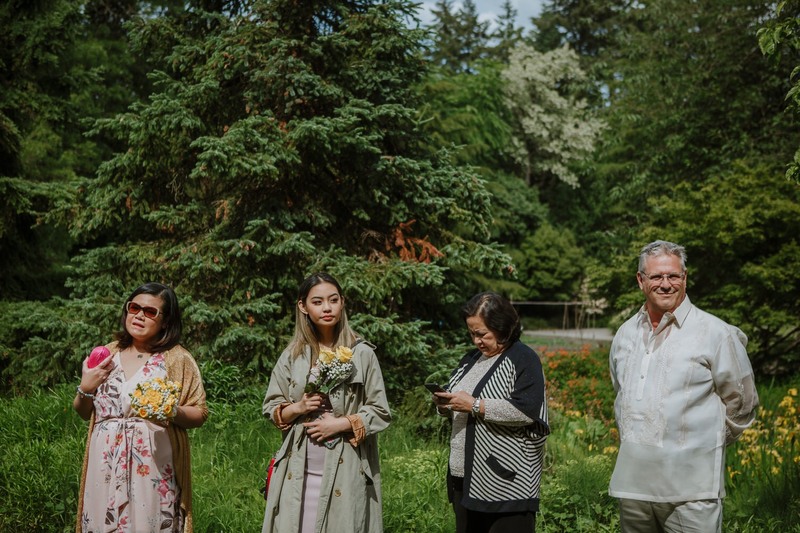 Families and friends of the couple arrived in the lush green Vandusen Botanical Garden for an intimate and small ceremony. In the midst of applause and wishes, beautiful Carol walked down the aisle dressed in white with the similar joy she must have worn 50 years ago and a bouquet of yellow roses in hand. While Frank stood waiting for his bride once again. Surrounded by tall, magnificent trees, the couple renewed their vows filled with gratifying laughter and exchanged invaluable wedding bands. 50 golden balloons stood out in the vibrant greenery as the loved ones of the couple took turns to say a few words and raise a toast to rejoice their half-century together. Happy tears, countless memories, and heartfelt smiles summed up the love and respect that Carol and Frank have gathered in all their years together. After their vow renewal, all the guests gathered to say a prayer for their happiness and unity. Thereafter, the couple left to take pictures in the middle of nature and pocket lakes that the Vandusen Botanical Garden graciously offers. It seemed that the countless trees, bushes, flowers and water plants bloomed at their most elegance to celebrate the beautiful 50 years Carol and Frank have shared so far while rejoicing more years to come. If you think Vandusen Botanical Garden will make a perfect site for your special day, write to me at hello@thisisitstudios.com for recommendations on breathtaking spots around the garden and area. Who knows? Maybe fifty years later you can celebrate your 50th wedding anniversary at the Vandusen Botanical Garden too! Can’t get over how lovely this couple is and how gorgeous the pics are! Such a beautiful Vandusen Botanical Garden, it is on my list to check out next time I am in Vancouver! Thank you for the kind words and yes, you should definitely visit it. There is entrance though and another alternative is Queen Elizabeth Park or Stanley Park. The images and emotions you captured throughout the day show how talented you are and Vancouver is lucky to have you! If I were a bride I’d be thrilled to have you as my Vancouver wedding photographer! What a beautiful story; a love that is 50 years old! You did such an amazing job capturing all the emotions of the day at the Vandusen Botanical Garden. My favorite shot was when he was holding her hand and when he kissed it and she was staring at him with so much love in her eyes, it looked like she could cry. Thank you! and THAT is my favorite photo as well. I think I even used it on my instagram account saying that hand kisses are my absolute favorite! The Vandusen Botanical Garden is perfect for a 50th Wedding Anniversary. I love this and I wish we did the same for my parents on their 50th anniversary. You captured all the significant moments flawlessly. What a lovely celebration of love! Never too late! When they celebrate their 60th you should definitely have a special photo session for them or just surprise them with their own celebration. Ahh such an incredible Vancouver 50th anniversary! This is so sweet! My parents are celebrating their 50th this year! So inspired! I’m glad it inspired you! I think 50th wedding anniversaries are my favorite now! Oh my goodness, this Vandusen Botanical Garden wedding is simply captivating! I just LOVE vow renewals/anniversary renewals. So much emotion and beautiful family moments you captured here! oh my goodness! How beautiful! You’re an amazing Vancouver wedding photographer! I’m obsessed with your work!